Spring Banquet - You’re Invited! Please Join Us! Year-End Match: Over the Top! Thank you! Thanks to the 26 donors who surpassed a generous $6200 2018 year-end match! A total of $16,588 came in, for $4,100 over the match total of $12,400. You're ensuring that more will be freed from abuse, and reached with the healing of Jesus in 2019! AmazonSmile Donates 10x This Week Only! Through Nov 2, AmazonSmile is donating 5% (ten times the usual amount) to Door of Hope Redeeming Lives Restoring Families when you shop at smile.amazon.com/ch/46-2329178. 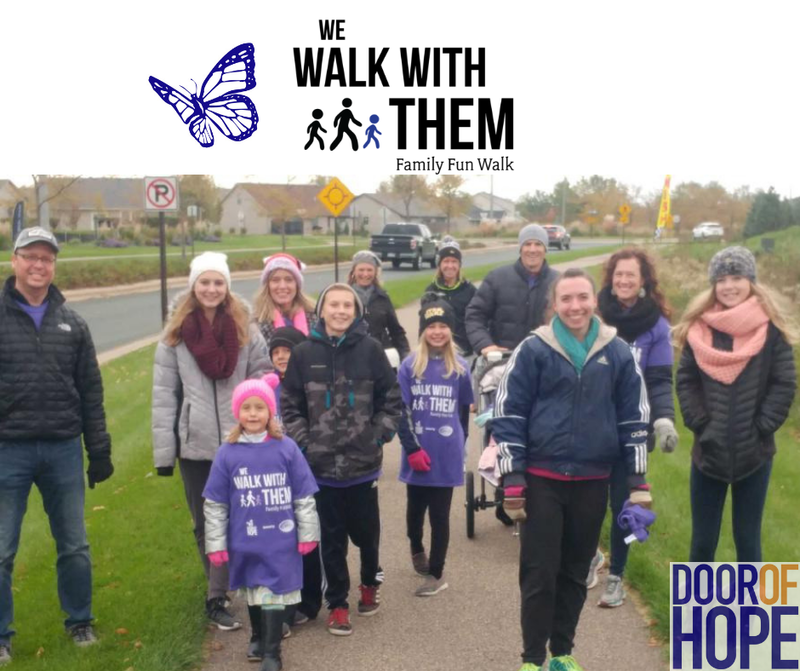 On October 14th, friends of the ministry walked to show their support for those healing from the effects of abuse. The chill and snow didn't stop 60 registered walkers from raising $8,082! Thanks walkers! Because of God's love through you, families have hope and the support they need to journey on their way to healing from trauma and abuse. Big thank you too, to our amazing volunteers! We couldn't have done it without you! Thanks to Abundant Life Church for graciously hosting our post-walk celebration! Finally, thanks to Zealous Creations for their corporate gift and to Ricky's Embers for sponsoring the event! After we walked, we moved to Abundant Life Church for a time of fun, food and fellowship. About 200 friends joined us April 21 to celebrate God's work and provision for this ministry. Thank you to all of you who joined us! Although, at $35,000, we fell short of our $75,000 goal, we know God will continue to bring this work to more and more of His precious ones. Thank you for your prayers, and for your donations of time and money. Each heart that reaches out brings hope and healing to generations to come. Your presence with us is proof that God is up to something wonderful! PS Special thanks to Emcee, Silvia Ontaneda; Harpist: Stephanie Claussen; Adrielle Royale Photography; Roses Donor, Word by Word; Host Site, North Heights Lutheran Church; Caterer, Atlas Grill; and Sponsor, Ricky's Embers.